When resources are available, advanced technologies such as drone surveillance or other tracking and sensing systems might be the fastest way to nab wildlife offenders. But anti-poaching and anti-trafficking work also relies on low-tech, tried-and-true methods. One of the oldest and most reliable? Dogs. 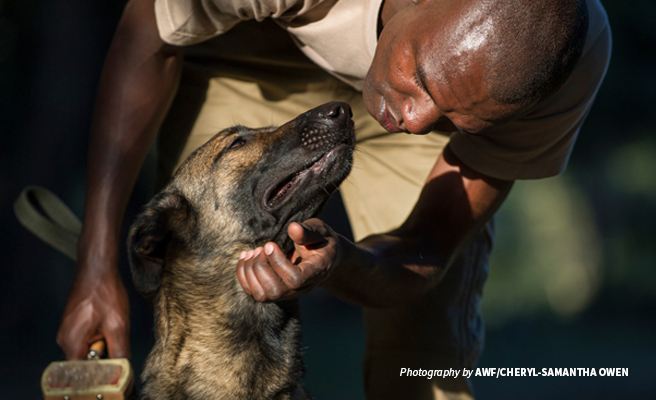 African Wildlife Foundation leads the way in the use of detection dogs to combat the illegal wildlife trade. In partnership with wildlife authorities such as the Kenya Wildlife Service, our Canines for Conservation dog-and-handler teams — deployed at airports and other trafficking hotspots — have uncovered millions of dollars’ worth of ivory, rhino horn, and other illegal wildlife products.